The Global Volcanism Program has no activity reports for Kita-Ioto. The Global Volcanism Program has no Weekly Reports available for Kita-Ioto. The Global Volcanism Program has no Bulletin Reports available for Kita-Ioto. No historical eruptions have occurred from the deeply eroded Kita-Ioto stratovolcano, which forms a steep-sided basaltic cone rising 792 m above the sea. 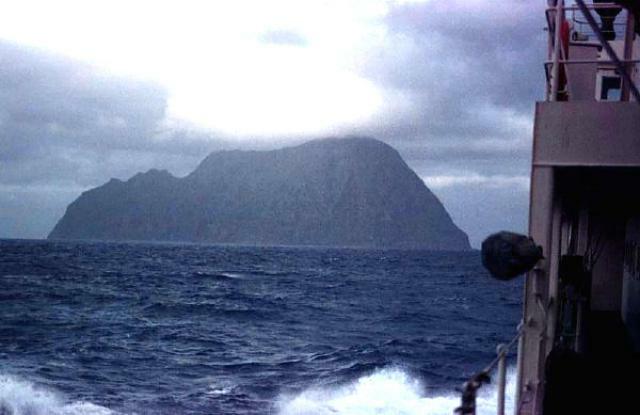 However, eruptions have been recorded since the 18th century from Funka Asane, a submarine vent 4-5 km NW of the island. Kita-Ioto is the northernmost of the Kazan Retto (Volcano Islands), located in the middle of the Izu-Marianas arc. There is no Deformation History data available for Kita-Ioto. There is no Emissions History data available for Kita-Ioto. Kita-Iwo-jima is seen from a ship west of the island. No historical eruptions have occurred from the deeply eroded Kita-Iwo-jima stratovolcano, which forms a steep-sided cone rising 792 m above the sea. However, eruptions have been recorded since the 18th century from Funka-Asane, a submarine vent about 2 km NW of the island. Kita-Iwo-jima ("North Sulfur Island") is the northernmost of the Kazan Retto (Volcano Islands), located in the middle of the Izu-Marianas arc. Copyrighted photo by Toshitsugu Yamazaki (Japanese Quaternary Volcanoes database, RIODB, http://riodb02.ibase.aist.go.jp/strata/VOL_JP/EN/index.htm and Geol Surv Japan, AIST, http://www.gsj.jp/). There are no samples for Kita-Ioto in the Smithsonian's NMNH Department of Mineral Sciences Rock and Ore collection. IRIS seismic stations/networks Incorporated Research Institutions for Seismology (IRIS) Data Services map showing the location of seismic stations from all available networks (permanent or temporary) within a radius of 0.18° (about 20 km at mid-latitudes) from the given location of Kita-Ioto. Users can customize a variety of filters and options in the left panel. Note that if there are no stations are known the map will default to show the entire world with a "No data matched request" error notice. Large Eruptions of Kita-Ioto Information about large Quaternary eruptions (VEI >= 4) is cataloged in the Large Magnitude Explosive Volcanic Eruptions (LaMEVE) database of the Volcano Global Risk Identification and Analysis Project (VOGRIPA).